The University of Richmond Collegian has an image gallery from the UMass-Richmond game. The Boston Herald said New England teams (including UMass) went with balanced offenses Saturday. The Daily Press has the CAA standings, inverted version. Villanova's status is still murky in the the latest Big East machinations. 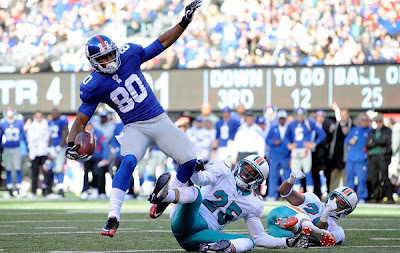 Victor Cruz does it again; catching the winning TD for the Giants. Metro.us says Victor is emerging. "The National Weather Service reported nearly two feet of snow in Concord and other parts of the state, with 31.4 inches falling in Jaffrey." The UMass defense looked like one of Don Brown's defenses of old yesterday as Minutemen defenders pulled the legs off the Spiders. The Spiders rushed 27 times for 1 net yard. UMass had 6 sacks and knocked Aaron Corp out of the game. The UMass defenders had 13 TFL and 4 INTS for 103 yards in returns. The UMass defense's performance was as good as it gets. The Minutemen offense was less stellar. UMass punted 6 times. Three times UMass had first-and-goal and came away with zero points. Minutemen TE Emil Igwenagu and Rob Blanchflower had only one catch each. The offense went 3-14 on third downs and 0-3 on fourth downs. One good thing was we did not turn the ball over, which meant Richmond never had a chance to rally. The kicking game continued to have problems. UMass missed two makable FG's. UMass averaged 26.2 net yards per punt. With two out of three remaining games at McGuirk, UMass has a chance, with the way the defense is playing, to end their time in the CAA with a statement. UMass athletic dept story here. Richmond's writeup here. Boston.com said Hernandez and the UMass defense smacked the Spiders. The Boston Herald said UMass picked off Richmond. The University of Richmond Collegian said the Spiders came out flat. The Richmond Times-Dispatch stated the Minutemen intercepted the Spiders. They also have an article Corp throws four INTS. The Times-dispatch has notes from the UMass-Richmond game. MassLive.com related the Minutemen cruised past Richmond. Maine crushed UMass' next opponent Villanova 41-25 in the snow. TSN has some of the results from around FCS here. Speaking of snow, Jaffrey got 14-16 inches of the stuff last night and I've got to go dig out. It was an amazin' storm. First Row Sports has a link to a free video feed for the UMass-Richmond game. I have no idea if it will work, but it did work for the Old Dominion game. Give it a try at game time. UPDATE: The link is working for me with Comcast internet. CAA Game Day Central with all of today's League game info here. Matty V. has an article on UMass' last trip to Richmond. The Gazette also has this week's Matty V Vs Matty G.
Jeff Thomas says UMass is looking to finish the Spiders playoff hopes. The Richmond times states Richmond is looking to finish the UMass game. The Spiders' website has their Game Day Game Plan. 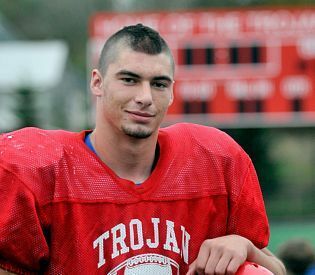 Former UMass QB Jesse Hunt is now the starting QB at Stonehill College. We could have beaten UNH last week except for mistakes: turnovers, special teams and extra points. UMass does not need to give the Spiders any short fields. The Spider run defense is one of the worst in the nation. Let's not have any turnovers and run them over with Hernandez. The Boston Herald reports UMass is looking at Nick Schlatz, a 6-2 200 pd athlete from Bridgewater-Raynham HS in MA. Herald bio article on Schlatz here. Mentioned in this ESPN Boston Blog. Also drawing looks from URI and Brown. Matty V. reports that Brandon Yelovich, who transferred from Rice, is now the starting field goal kicker. Richmond AD Jim Miller is the subject of this article from the Richmond Times-dispatch. UNH can't overlook URI (talks a lot about the UMass game). TSN previews this week's FCS games. Off Topic. This article mentions UMass in a revised Big East basket ball league. The San Francisco Chronicle says the $2,000 stipend to athletes just makes life even more difficult for non-BCS schools. BTW, it snowed enough here in Jaffrey last night, that they were plowing the roads..
Rivals.com has UMass interesting in Kendall Anderson, a 5-9 185 pd RB from Centreville, VA.
His 2011 stats here. Averaging 8+ yards/carry. Also interested are Boston College, JMU, Maine, Villanova and William & Mary. Ron Chimelis looks at the status of UMass-Temple. Jeff Thomas says Julian Talley is "Showtime" on an off the field. The UMass Daily Collegian states the Minutemen need to be efficient in the red zone against Richmond. Craig Haley of TSN looks at this week's FCS games in his "In the FCS Huddle" column. Matty V . says the UMass place-kicking position is still open. The Richmond Spiders have their game notes for UMass up: html here, .pdf here. The UMass Gameday for Richmond is here. More on the Maine Black Bears comeback win over the Spiders last week. Maine blocked two Richmond extra points. BTW, the Spiders recently announced their OOC schedule through 2016. Virginia is a winnable FBS game and the Spiders should feast on the likes of Gardner-Webb, VMI, Hampton and Morehead State. The CAA has its weekly press release up. There's talk of a Big East/C-USA/MWC super conference. I would think there would be room for UMass in that collection someday. Jordan Broadnax runs against the Hens. UMass has been dropped out of the FCS Top-25 polls, but Matty V wonders why Delaware is still in them. Keepers College Football rankings has UMass at #35. He has JMu over UMass by < 3. Besides the Bill Knight trophy, two UNH players won CAA awards this week. Two JMU players had surgery this week and will be out for the season. Matty V remarks on CAA teams not matching preseason expectations. The Boston Herald has a story about the end of the UMass-UNH rivalry. WEEI looks at the Patriot secondary and mentions James Ihedigbo. Montana leads FCS football in tased football players. Brandon Potvin & Perry McIntyre sack Tim Donnelly. Click for a larger view. Matty V. has three stars from the Colonial Clash. Jeff Thomas says this is a hard team to figure out. SeasCoastOnline reports that Kevin Decker showed his versatility. The Union Leader states the CAA Championship is still UNH's goal. RS FR Matt Campbell 6-1 230 is the subject of this article from the Attleboro Patch. TSN relates CAA powers Delaware and William & Mary are not likely to make the FCS playoffs. They also have a story on Maine making the most of the fourth quarter. Boston College's 30-14 loss to Virginia Tech left the Eagles at 1-6 in 2011 and grasping for anything positive. Julmiste's 72 kickoff return yards against UNH pushed him to #3 in single season kick return totals. He now has 21 returns for 621 yards in 2011. Number #2 in season kickoff returns is Adrian Zullo (31-681 in 1998). His current 29.57 yards/kickoff places him #1 in season kickoff return average. Currently #2 is Dennis Dent @ 28.31 in 1978. Julmiste's career totals of 35-841 yards place him at #10 in career kickoff return yards. Number 9 is Stephen Parnell at 36-881 career yards (1968-69). Julmiste's career 24.02 yards/kickoff average place him #3 behind Gary Pearson's 24.41 (39-952 1979-82). If UNH is a playoff team, and they certainly seem to be, then UMass is very close to being one. Although UMass lost its second straight to UNH in the Colonial Classic there were still some good things going on. First the good: UMass's defense that looked over matched against ODU, continued its Renaissance. Despite the two turnovers early, the UMass defense was fully competitive with UNH's high-powered offense. The Wildcats average 34 points a game, 444 yards/ game offense and 294 yards/game passing. The UMass defense held UNH to 27 points, 334 total yards and 137 yards passing. In addition, the blitzing UMass defenders pushed Decker out of the pocket numerous times forcing him to run with the ball. The defensive performance was even more impressive since the Wildcats had a good day on kick returns and had very good field position all game. Also impressive was the UMMB, who sparkled with the half-time performance of jazz standard "Big Noise from Winnetka". Great show. It came down to UMass mistakes. UMass turned the ball over on our first two possessions. UMass missed two extra points, causing the Minutemen to be down two scores in the last five minutes. UNH hit a 47 yard field goal into the wind, made a two point conversion and hit all their extra points. We were not playoff caliber on special teams. The UMass offense was inconsistent. The Minutemen moved the ball, but went three-and-out with the ball on the UNH 48 yard line in the third quarter. With the defensive improvement, I still think UMass can make a run in the rest of the season. BTW, the announced crowd was 24,000. The parking lots were packed. Did some people not come in for the game? It certainly looked like there were more than 24,000 people there. Matty V indicates UMass couldn't complete the comeback. He also said missed extra points plagued the Minutemen. Boston.com says UNH bid adieu with a win. The Boston Herald said UMass couldn't catch the Cats. The Worcester Telegram said UMass was derailed by a poor start. Jeff Thomas reports that UMass fell to the Wildcats. CBS3 has a story on UMass falling short. Foster Daily Democrat asserts Dontra Peters and the Wildcat rushing game did it for UNH. The Nashua Telegram relates UNH stopped UMass. Maine scored 23 points in the fourth quarter to keep their 2011 run going. Rhode Island had been losing games by close scores all season. They finally unleashed their frustration on Delaware. All the CAA results and box scores here. Matty V. says UMass and UNH clash one more time. And Matty G Vs Matty V--Week#8. Boston.com says UMass and UNH part ways after today. Fosters Daily Democrat says a sad end to UMass-UNH rivalry. Jeff Thomas says this could be a high-scoring affair. The Mansfield Patch mentions local player Tom Gilson's big day. The CAA website has its "Game Day' article up. UMass-UNH is the only game on TV. K.C. Keeler says Rhode Island's record is "deceiving". Boston College is still looking for their first FBS win. TSN has "In the FCS Huddle --A primer for the playoffs". All right. We did a great job against the Hens last week not turning over the ball. Let's run Jonathan Hernandez down the throats of the Wildcats and get a big win in Gillette. Hope to see everyone there. Go UMass!!!! Matty V. reports on the last ever UMass-UNH game. Mike Zhe of Seacoast Online does the same from the Wildcat side. The Boston Herald reports on UNH's Chris Beranger and Matt Evans as they prepare for the game. Fosters Daily Democrat says UNH is excited to be playing at Gillette. The Concord Monitor quotes Coach Morris saying UMass will have it's own locker room at Gillette. The NY Daily News has a feature on Victor Cruz and how he made it through UMass. 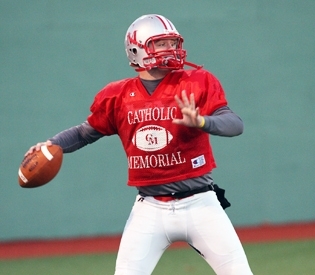 Brandon Walsh of North Andover has a baseball offer from UMass, but no football offers. Villanova's basketball coach Jay Wright says "Let us in the Big East for football". Sean Shapiro has TSN's its FCS Week #8 preview and predicts UNH over UMass. ESPN reports UMass has shown interest in John Robinson, a 6-2 225 pound LB from Worcester Academy. Also showing interest are UNH, UConn, Boston College, Stony Brook, Villanova, Old Dominion and Dartmouth. Matty V reports UMass, after reviewing game tape, decided to suspend Ryan Delaire for one game. Matty says the rivalry with UNH will be hard to give up. 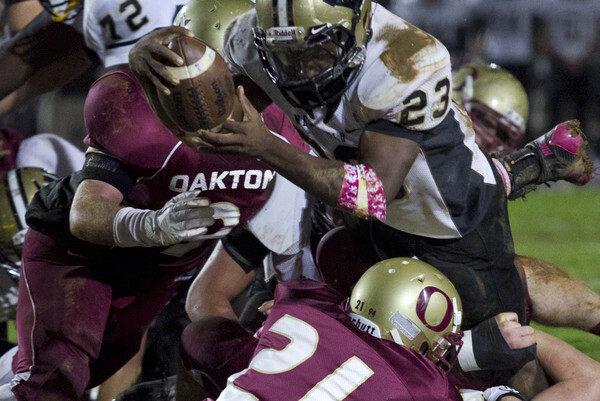 He also has a feature on Jordan Broadnax, who is now the #2 running back. Imagine the running game we would have if everyone was healthy. UNH has its game notes for UMass up (html). Jeff Thomas says the UMass defense is feeling better. Keepers College Football Rankings has UMass #35. He also has UNH over UMass by 5.1 points. Craig Haley of TSN says the race for FCS awards is very competitive this year. Philly.com says Villanova is OK with Temple in the Big East for football, but not for hoops. 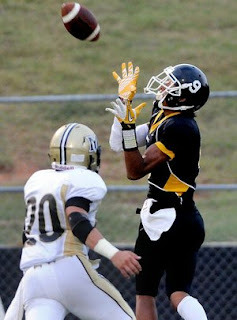 Rivals.com reports UMass is interested in Julian Jones a 6-2 210 pd WR from Cantonsville Senior HS in Baltimore, MD. Also interested are Army, Navy, Maryland, Duke, Lehigh, Towson and Harvard. Matty V reports on the latest in UMass news. Virginia Tech transfer Jerome Lewis was injured in practice. Tom Gilson was named game captain for the UNH contest. Former Minutemen Victor Cruz and James Ihedigbo might be at the Colonial Clash. The UMass Daily Collegian has more on the schedule of events for the Colonial Clash. The Collegian has more on the UNH game. UNH's R.J. Harris RSFR WR 6-0 194 has been added to the Jerry Rice Award watch list. I assume you have heard that UNH students successfully fought off the attempt by Manny-State Nazi's to take over the school's dinning commons. The Black Bears try to keep it going against Richmond this Saturday. William & Mary set several team records against UNH last Saturday. TSN reports that police resorted to pepper spray to clear the field after Southern and Arkansas Pine Bluff teams went at it after their game Saturday. UMass has shown interest in Malachi Jones, a 6-1 185 pd WR from Central Gwinnett HS in GA. Article featuring him here (mentions UMass). This ESPN article features Jones. Also showing interest are Notre Dame, Michigan State, UCLA, Middle Tennessee State, Georgia Tech, Virginia and Duke. UMass has released the schedule of events for the Colonial Classic. The UMMB will be there as well as the UNH band. Strangeness in the FCS polls this week. UMass is #22 in the TSN poll. However, UMass is in the "others receiving votes" section of the FCS Coaches Poll. Note that Delaware is still ranked #13 in the nation. Note also that two of the four Hens wins have been over DII West Chester and Delaware State (2-4). UMass is 6th in the Lambert Poll. Trevor Sasek is back as the starting QB for Delaware. Darren Thellen makes the Boston Herald's "College Football Heroes" list. Speaking of heroes: Jesse Julmiste's current 18-549 30.5 AVE kick return totals rank him as #4 in UMass single season kick return records. He needs 54 yards to pass Steve Parnell's 603 yards (1968). Julmiste needs 239 more yards to break into the UMass Top-10 career kick returner list. Two CAA running backs won national honors from TSN this week. Rivals.com reports UMass has offered to Nicco Whigham, a 6-1 195 pound Safety from Cardinal Gibbons HS in Fort Lauderdale, FL. Whigham says he has no leaders at this time. Besides UMass, he holds offers from Bowling Green, Buffalo, UConn, Marshall, Memphis and West Virginia. Matty V. says Jonathan Hernandez is OK. He mentions Ryan Delaire's ejection from the game, which certainly got the Hen fans in my section fired up. A note on Hen fans. Jeff Thomas says UMass' defense and special teams stood out Saturday. There are statistics and then there is THE statistic---- turnovers. See any correlations in this table? The UMass Daily Collegian looks at the Delaware victory and says the Colonial Clash is next. The Boston Globe has a story on James Ihedigbo's creation of the HOPE Africa Foundation. If you missed it, UNH lost their ninth straight to William & Mary Saturday. That's quite a streak. UNH has been a strong team the last ten years. It's strange how one team seems to always have the advantage on another. Well, that was better. Yesterday's win over the Hens was one of the most satisfying in a long time. The Minutemen really put together a good game. Coach Morris said Kellen Pagel had a good week of practice and it showed. He looked much more decisive and handled the offense efficiently. More important, he did not turn the ball over and was accurate in his passing. I don't know how it was described in the TV broadcast, but the wind was really booming. UMass had the wind in the first and fourth quarters. Emil Igwenagu had another excellent game as the 246 pound TE out jumped two Delaware defenders for a UMass TD. Johnathan Hernandez appeared to have a stinger in his arm or shoulder and DNP in the 2nd and 3rd quarter. The Hens were 2nd in the CAA in scoring defense and 3rd in overall defense, so that is the strength of their team. UMass had a couple of drops in the second half that could have extended Minutemen drives. But it didn't matter, because the UMass defense also had their best game of the season. Shane Viveiros (playing LB) and Ed Saint Vil combined for 12 tackles. The defensive backfield knew their assignments. The Minutemen defensive line was dominate in the fourth quarter. The UMass defense shut down the Hen running game allowing Delaware star RB Andrew Pierce only 85 total yards. The much maligned UMass kicking game was excellent. The punters dropped two inside the Hen 5 yard line. Great effort by the whole team. Jeff Thomas said the UMass team started strong. Matty V. said UMass won with early offense and strong defense. Matty also has three stars from the game. The Boston Globe said UMass surprised the Hens . The Boston Herald said UMass left the Hens blue. Delaware Online said the Hens were doomed at the start. They also said Delaware has questions at QB. Quotes from K.C. Keeler after the game. Matty V. looks at today's game against the Hens. He also says UMass' future with the MAC is safe. Jeff Thomas says that with all the conference reshuffling, UMass is happy with the MAC. Meanwhile, the Delaware trumpet is back . Noise makers are now OK at Hen games. K.C. Keeler says poor student attendance is baffling. This article says the NCAA is exploring scholarships cuts for both FBS and FCS football. Dropping the number of scholarships to 80 from 85 would be a significant cut. It would probably mean an influx of talent for "Mid-Major' schools like UMass as the football factories would not be able to stockpile players. TSN says transfers are making an impact in FCS this year. UMass has been on the wrong end of some upsets, but it sure would be nice to turn that around and upset the Hens today. Mrs Blog and I will be in Newark and cheering for the Minutemen. Let's play well and take it to Delaware. Go UMass!!!! I've blogged about A.J. Doyle twice before. Doyle recently decommitted to North Carolina State. He wants to play QB and UMass is mentioned as one of the schools willing to give him that chance. Sporting News has another article on Doyle's decision. The Boston Herald also has an article on Doyle's reopening his recruitment. Matty V. has an article about Kellen Pagel's week and his return as starting QB. He also reports Shane Viveiros is back and Mike Lee is out for the season. 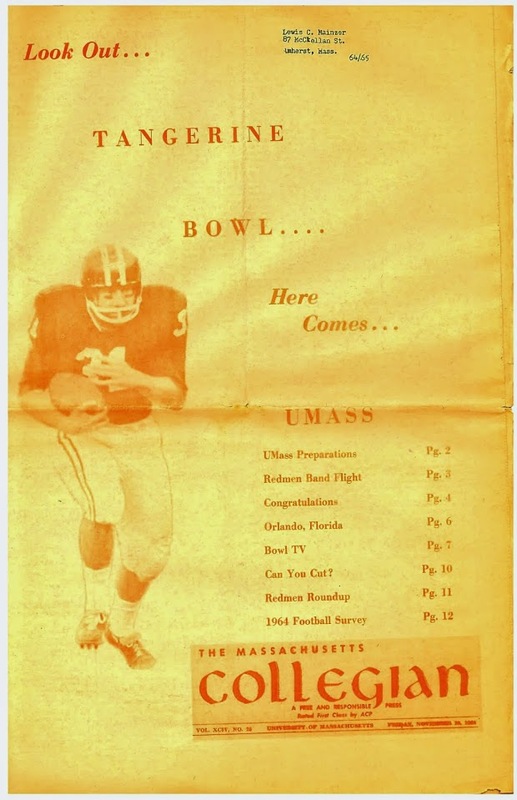 UMass' game notes (.pdf). Hens game notes (html). Delaware OnLine says the Hens hope to send UMass off with a loss. More on Delaware's tempest-on-a-trumpet. Remember Signman's dented trumpet? Delaware security would've has a stroke if they had heard that baby. Sean Shapiro of TSN has the Week #7 preview of FCS football. VanDelay Sports picks this week's MAC games. Check out the stats for Temple's Bernard Pierce (Temple Bio). Off topic: UMass picked 12th in A10 hoops. Sigh. According to Scout.com. UMass has received its second verbal for the 2012 season when Joe Jones, a 5-11 224 pd all-purpose RB from North Gwinnett, GA committed to the Minutemen. Rivals.com has a video interview with Jones and mentions UMass. WWLP22 has a story about Coach Morris' interest in the fight against Juvenal diabetes. The UMass Daily Collegian has an article about Saturday's game against Delaware. They also have an article on Jesse Julmiste. A couple of days ago, I mentioned I thought Emil Igwenagu had the best chance of any senior Minutemen to make a NFL squad. Jeff Thomas has an article about Igwenagu and discusses his pro potential. The Orlean Times (home of St. Bonaventure I believe), mentions the possible impact of football realignments on the A10 and mentions UMass. University of Delaware police arrested "Trumpet Man" at last week's Hen game. 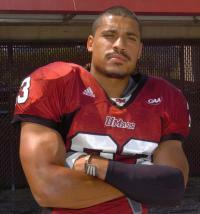 Speaking of Delaware, the Bears added Anthony Waters, a free agent from the Hens to their roster. Who would have thought it? ODU-Towson may be the biggest game in the CAA this week. Mrs Blog and I will be on the road for the rest of the week, ending up with us taking in the UMass-Delaware game in Newark. As usual, I'll try to keep the blog going if I have a wi-fi connection. Matty V. says Kellen Pagel, Quinton Sales and Ed Saint-Vil will all be available for the Hens game Saturday. We're #52 according to Keepers College Football rankings. He also has the Hens over UMass by 13+. Jeff Thomas has a stub article on Jesse Julmiste's CAA Special Teams Player-of-the-Week award. The NBA lockout means more TV exposure for MAC football. 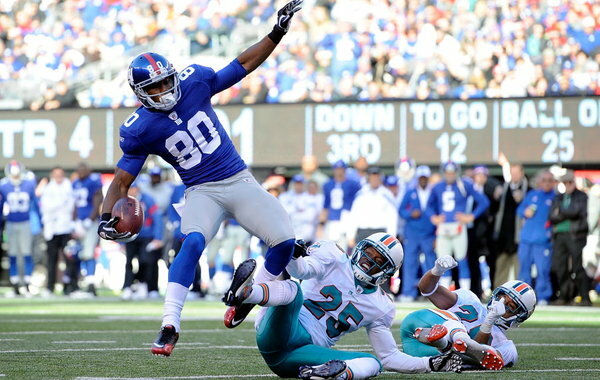 The NY Times says the Victor Cruz show is both good and ugly. The Wall Street Journal says Cruz is doing pretty good, seeing that he has yet to start a game. TSN's Craig Haley has FCS news in his "IN the FCS Huddle" column. 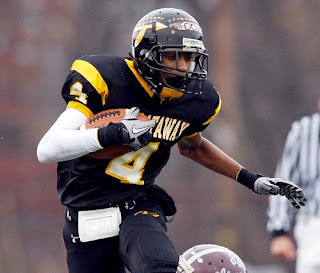 Rivals.com says UMass has offered to Tajae Sharpe, a 6-3 175 pound WR from Piscataway, NJ. 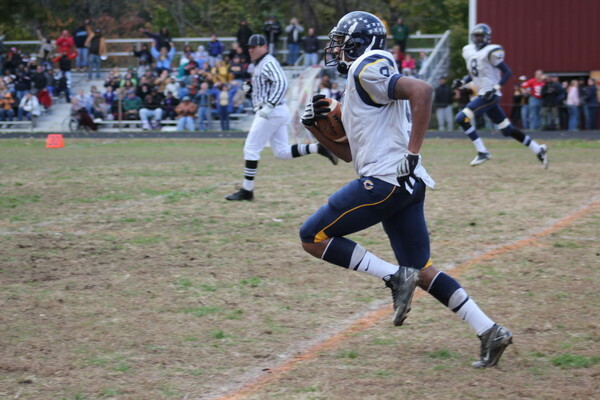 Sharpe holds offers from Delaware, JMU, Kent State, Pittsburgh, Temple, Towson and Villanova. Matty V reports Julmiste is CAA Special Teams Player-of-the-Week. As he should be. The CAA original report here. He also says we're committed to the MAC. As I have said a zillion times, we need a functioning FBS program to be considered in any conference realignment talks. UMass will still be a "transitional" team (not eligible for bowl bids or the MAC championship) next year. So, I expect the Minutemen to be committed to the MAC---until we're not. The Boston Globe says UMass is on edge. Of course, being the Globe, they would say that. The New York Times says the CAA and the Atlantic 10 are eying each others teams. The UMass Daily Collegian recaps the CCSU game. The Hens are looking forward to playing UMass. Delaware wants to send us off with a loss. WDEL says UMass-Delaware play for the final time Saturday.One thing about this season a win or loss is forever. No "We'll get 'em next year". Patch.com has a story about UMass' Andrew Dees, who is the UMass running backs and recruiting coordinator this year. Dees' UMass bio here. Matty V. talks about CCSU HC Jeff McInerney's decision to kick to Jesse Julmiste. He also reports Coach Morris says Kellen Pagel is still the UMass starter at QB. He has a sub-feature on Emil Igwenagu's big night against the Blue Devils. The Worcester Telegram has a CCSU game story with a nice image of Igwenagu. BTW, if I had to bet on the UMass senior that was most likely to make an NFL team this coming spring, I'd take Igwenagu. He'd be an H-back in the NFL. MassLive has a seven-image photo gallery of the CCSU game by staff photographer Michael Beswick. UMass President Robert L. Caret is embarking on a bus tour of the State to better understand how the University can better serve Massachusetts. Things are not getting any better for Boston College. The Eagles announced that Montel Harris and Kaleb Ramsey are done for the season. Rumors say BC was involved in blocking UConn's move to the ACC. Victory Cruz had a wonderful twisting catch against the Seahawks yesterday and was again involved in a seriously weird play. The Seattle Post says Cruz's greatest day turned. The Sports Network says CAA stands for "Crazy Astonishing Agonizing". TSN also recaps Saturday's action in FCS. City hires mimes to reprimand bad drivers. Some good things happened at McGuirk last night as well as some "OK" things and a couple of bad things. A really good thing was Jesse Julmiste. If you havn't yet seen him in person, make it a point to come out to McGuirk to see him play. Julmiste was leaving contrails in the cool October night. He had four returns for 148 yards and one 90 yard TD. Julmiste took the kickoff then went to Mach 2 and was still accelerating when hit the endzone. His two kick return TD's this year ties an all-time UMass record held by Phil DeRose and Dennis Dent. He also had a 31-yard run on a reverse. The UMMB seemed to get its mojo back as the band and the visiting HS bands put on a show that the band, new director Tim Anderson ------and George Parks would have been proud of. The offense did not have a single turnover. Brandon Hill not only did not throw any INT's, he didn't come close to throwing one. Darren Thellen had two INT's including an 85-yard return for a TD. Emil Igwenagu caught a sideline pass and the 245 pound TE out ran the CCSU defenders for a 58 yard TD. Oh, and I heard Shane Viveiros will be back for the next game. Since UMass has not announced the reason for his absence, I won't either. However, I hope to God that the previous scheme of moving him to LB will be scrapped and he will be back at safety. Some OK things: I was mentally writing good things about the UMass kicking game. Brendon Leavengood thumped a 35 yard field goal that would have been good ten yards further. Jeff Strait made a nice play fielding a high snap----then Leavengood missed a extra point and Ray Pendagast hit a worm burner of a punt. And some bad things: the offensive line seemed to be having an off night as the CCSU defense shut down Jonathan Hernandez and the UMass rushing game in the second half. Jeff Thomas says UMass used big plays to defeat CCSU. Matty V. said Jesse Julmiste sparked UMass to a win. He also has three stars from the CCSU game. All the CAA results here. If you missed it, Maine (!? ), Towson (!???) and UNH are leading the league. Boston College was in a "Death Valley Downer" as the Herald put it.